We here at 9Stein are nature fetishists. We love all things colossal, powerful beyond human measure and which remind us of our minute place on this planet. We especially love volcanoes! There’s nothing quite like a massive, smoldering, pressurized volcano blowing its top and reducing the surrounding human civilization to dust to remind us of the power of nature. Some of the worlds greatest volcanoes are to be found in Indonesia, a beautiful archipelago which lies in South East Asia in the infamous “ring of fire”. 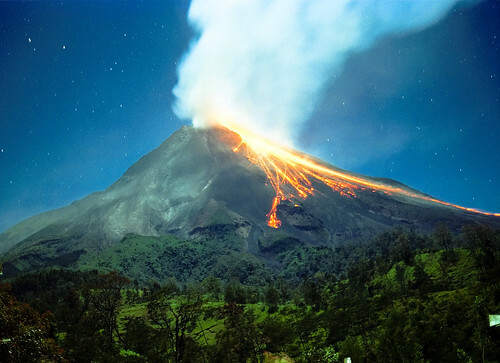 It is host to some of the worlds most spectacular volcanoes and has seen some of the most epic eruptions in history! While there are certainly many impressive volcanoes around the world which we could have included on this list, we decided to focus exclusively on Indonesia for this list post. Are you ready to have a broad stroke view of some of mother natures most powerful creations? Kick back, relax and enjoy this list of cataclysmic beauty! Let’s kick things off with the daddy of Indonesia’s 140 plus volcanoes – Lake Toba. 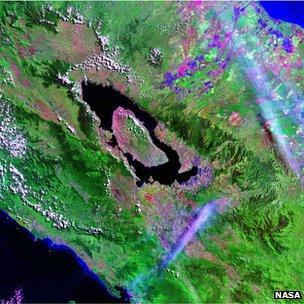 Located in the middle, northern part of Sumatra, this lake which is 100 kilometres long and 30 kilometres wide is the site of a MASSIVE VEI 8 supervolcanic eruption that happened about 75,000 years ago. Toba sits in the caldera which was formed as a result of the magma chamber below emptying its contents in spectacular fashion during that famous mega eruption. In the middle of Lake Toba you will find Samosir island, which is the largest island within an island in the world, covering an area of 640 square kilometres. To put that into some kind of context, the country of Singapore is slightly larger at 718 square kilometres. The big question is, when will this beauty of nature go pop again? Recent reports have said that residents within Toba’s surrounding areas have noticed the tiles on their floors are becoming hotter and the island of Samosir continues to steadily rise each year indicating, slowly, but very, very surely the day will come when the gates of hell are re-opened. Situated on the island of Sumbawa sits my personal favourite – Mount Tambora. Too many, this volcano is not as famous as some of the others which Indonesia has to offer but it more than deserves its place on this list. 200 years ago, Mount Tambora exploded in anger, producing a staggering VEI 7 eruption which is the largest eruption the planet has seen in the last 10,000 years. More than 50 cubic kilometres of magma was spat out, on top of the ash and aerosols which were blown up as high as 50 kms into the stratosphere. The total body count exceeded 100,000 both directly – those living in and around the island, and indirectly – through the volcano producing a year without summer in 1816 meaning crops failed to grow all around the globe. Today, this awesome stratovolcano stands proudly at 2850 metres tall and it forms the entire 60 km wide Sanggar Peninsula; however, research has shown that previously she was as tall as 4000 metres – meaning that more than 1km was blasted from her crown at some point in history. This is real life beauty and the beast at its pure best! Okay, anak meaning child in English, does not make the list for her own exploits but rather those of her mother before her. Mummy, simply known as Krakatau or more commonly known in the west as Krakatoa, had finally had enough and in August of 1883 with a cataclysmic VEI 6 eruption, she blasted herself out of existence. Krakatau, being an island surrounded by the sea on all sides, unleashed giant tsunamis in multiple directions, killing around 40,000 people. Sea levels were said to have risen by a few centimetres in the English Channel in the days following this monster eruption. The main explosion is thought to be the loudest sound ever heard in modern history and shock waves were recorded on barographs all around the planet. With multiple films made about this eruption, I believe this is the undisputed number 1 on my list of most well-known eruptions and who knows, perhaps in another 500 years the little child will be all grown up and ready to continue the legacy of the Krakatau name. This stunning stratovolcano, which lies just north of Yogjakarta city in central Java, dominates the skyline in the region with an impressive 2930 metre peak. The word ‘merapi’ means making fire and if you have been lucky enough, which I have multiple times, to visit this true gem of nature you will know why this name is most appropriate due to the fact that smoke can be seen bellowing from its crater nearly all year round. This is one of Indonesia’s most active volcanoes providing frequent eruptions every 4 – 8 years. The VEI 4 2010 eruption is to date, one of the largest eruptions so far this century, which killed more than 350 people mainly due to its famed pyroclastic flows she sets in motion when erupting. Mount Merapi is truly beautiful and it is located in one of the most wonderful places I have had the privilege to visit. A must see for anyone who is planning a trip to Indonesia. Moving back to the island of Sumatra again where we will find the remarkable Mount Kerinci. This is Indonesia’s highest volcano at just over 3,800 metres. Positioned in the province of Jambi, which is in the eastern central part of the island, Mount Kerinci is the most dominant feature with the Kerinci Seblat National Park which is also the home of the Sumatran tiger and Sumatran Rhinoceros. Kerinci is definitely one of the country’s more active volcanoes but thankfully, the eruptions are not as fierce as some of the other beasts on this list. Also, due to its constant growlings, the area around the volcano is sparsely populated which is always beneficial when an eruption does occur. Another, must see if you like volcanoes and are in the region because just like Merapi, this is a truly remarkable part of the world that shouldn’t be missed. With out a doubt, this is probably Indonesia’s most visited volcano. Mount Bromo is an active volcano within the giant Tengger Caldera. Although, not the highest volcano on the island of Java, that belongs to Mount Semeru which is close by, this is one place you just have to see to believe. If you hike up Bromo ready for sunrise your eyes will be treated to a sight like nothing they have seen before. The Tengger volcanic complex consists of 5 overlapping stratovolcanoes, each truncated by a caldera. This is another region which is extremely active and Bromo itself has erupted 3 times since 2004 causing a few fatalities. With Mount Semeru being just down the road and just as active, if not more so, one begins to wonder what kind of eruption could happen if all these pots came up to boil at the same time. That would be devastatingly spectacular to say the least. One of the most beautiful islands in Indonesia is Lombok, just east of Bali, and it is home to the impressive, 3,700 metre Mount Rinjani. This is Indonesia’s second highest volcano and it is famous for its amazing oval-shaped caldera which contains a 5km by 2km crater lake. Rinjani, like so many of Indonesia’s volcanoes is active. Her last dance at the prom was in May 2010 but this wasn’t anything to be feared and luckily no lives were lost and little damage was done to the surrounding areas. 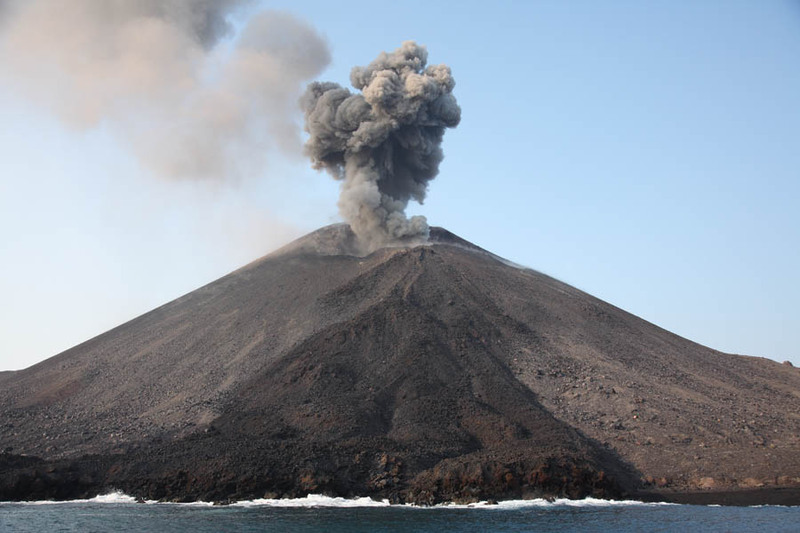 Records show, Rinjani has blown her top in the past in a more explosive manner with a VEI 2 eruption sometime in 1944. This tells us Mount Rinjani has the potential to turn nasty again one day but until that day comes – go and pay her a visit, another remarkable place with indescribable beauty. As if our first volcano – the glorious Lake Toba supervolcano – wasn’t scary enough, we can add Mount Sinabung into the mix becuase it is only 25 miles away. Another stratovolcano, measuring a not-too-shabby 2460 metres, Mount Sinabung gets on this list due to it lying dormant for 300 years before re-awakening. This is the beauty of nature, it serves up these unexpected surprises every so often and we have to sit back in admiration. 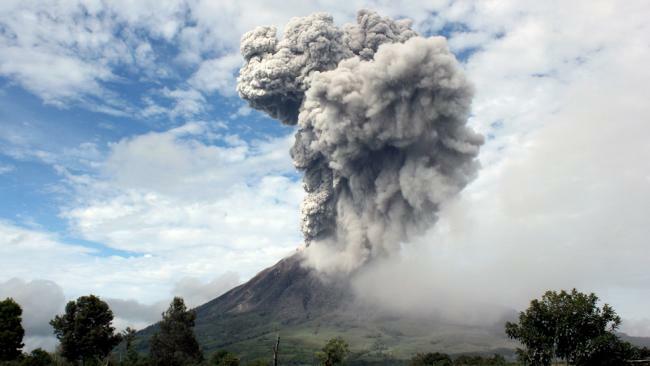 After such a long sleep, Sinabung has been making up for lost time by offering multiple eruptions since August of 2010 to the present day, this has led to 10,000 plus people being evacuated for fear of a major eruption at some point in the near future. We finish off the list by taking a visit to the tourist hotspot – the island of Bali – and saying hello to Mount Agung. This mighty stratovolcano pops its head above the clouds at 3,140 metres. It is such a dominating presence that it actually affects the weather in its surrounding area – clouds travel in from the west and Mount Agung snatches their water which in turn makes the western side lush and green and the eastern half dry and barren. The last recorded eruption was back in 1963 when in addition to large rocks and boulders being tossed out like an old newspaper, a highly viscous lava began flowing down the northern flank, reaching a distance of 7 kms – approximate estimates suggests a total volume of 50 million cubic metres was coughed up. After that phase had finished, a paroxysmal eruption kicked off, lashing out a 10 km high cloud of dust which collapsed to create devastating pyroclastic flows which ruined villages and claimed more than 1000 lives. If you are ever in Bali, this is a must see volcano, trust me, I’ve been there, you won’t be disappointed! These are a mere 9 of Indonesia’s finest volcanoes and if the truth be known, this list could have gone on and on several more times over. This is a country which is being pushed, pulled and twisted by some of the world’s largest tectonic plates making it one of the most seismic and volcanically active areas on the planet, however, these forces of nature have given us the splendid sights which can only be found in Wonderful Indonesia.